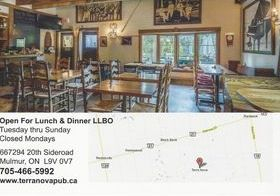 The Shelburne Transporter, Shelburne's Royal Canadian Legion, Google & YouTube. Terry Fox Run Organizer, Joan Wallace was very pleased with the support from The Hockey Training Institute girls during the Annual Terry Fox Run held on September 18, 2016 in support of the fight against cancer and cancer research. Click on image (L) and visit the Terry Fox Foundation Website. Click on image below and visit the Hockey Training Institute Website. Click on image above to visit page one of full coverage. Click on image (R) to visit page two of full coverage. And if you can imagine, there's more. Video coming soon! 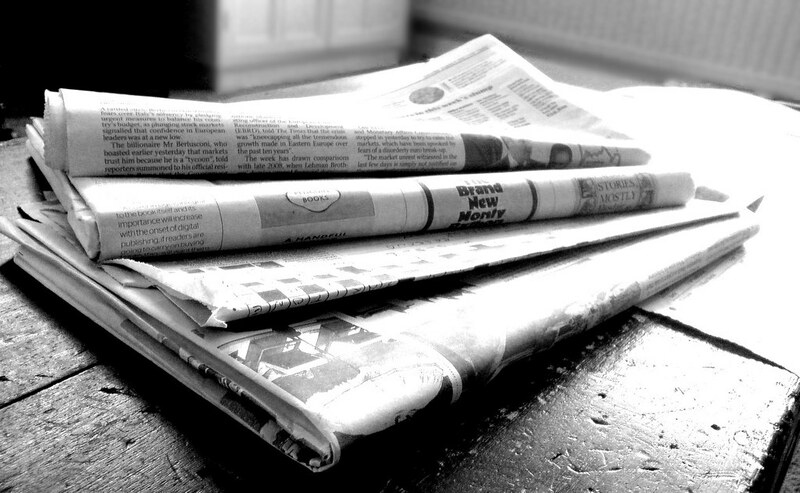 Calendar Girls, Dufferin Oaks, Music Memory Program, & Orangeville Music Theatre: Work Together In Improving Our Beloved Seniors' Quality of Life! Click image above for photographic coverage. Video and Article coming soon. Click on Image (L) and see how the Music & Memory Program Can Improve The Lives Of Those Living With Dementia & Alzheimers. See Henry's Story, Alive Inside. ( Association of Municipal Managers, Clerks and Treasurers of Ontario). The award was presented by Shelburne Mayor, Ken Bennington (L)to CAO, John Telfer(R) during the Shelburne Town Council Meeting held on Monday, September 12, 2016. The Recycled Teenagers Classic Car & Truck Club & Annual Charitable Donations Presentation Event Held September 13, 2016 at the Canadian Tire Parking Lot in Alliston. Click image (L) to visit Classic Car page for video and photographic coverage. Drive 4UR Community is a charitable fundraiser making waves towards positive change for local communities. A Trillium Ford Lincoln Ltd initiative, the organization recently raised $1,780 over the Pickin In the Park Weekend Annual Event with help from volunteer Shelburne Lion Club Members. Providing a number of vehicles to test drive for free, Trillium Ford donates money according to the number of test drives. Pickin In The Park Organizers, Greg and Heather Holmes will receive half the amount raised and presented to the Shelburne Lions Club which will be put towards the construction of the future Pole Barn to be built at Shelburne's Fiddle Park. The remainder of the money raised will be delivered via the Shelburne Lions Club to the community of Shelburne. The donation is greatly appreciated by Pickin In The Park Organizers, who have already raised $90,000 of the $120,000 they expect the construction to cost, the donation is a very welcome addition to a structure that will very likely attract many public venues to Fiddle Park including the ever growing and wildly popular Pickin In The Park. For more information of Trillium Ford Lincoln Ltd.'s Drive 4UR Community Fundraising Initiative, click image above and visit their website. (LtoR:Front) Pickin In The Park Organizers, Heather and Greg Holmes, Shelburne Lions Club Member, Art Vernon, ((LtoR: Back) Len Rice, Genereal Manager of Trillium Ford, Shelburne, Lions Club Member, Bob Osborne, Trillium Ford Sales Specialist, Bruce Lyon, Shelburne Lions Club Members, Jen Colley, Martin Mirander, and Jean Cheyne. Would You Take Off Your Clothes For Charity? What About Raising Money For The Improvement Of The Quality Of Lives For Our Beloved Seniors? How The Orangeville Music Theatre Is Impacting Our Community In A BIG WAY! Click on image above to visit The Orangeville Music Theatre 's Website.
" Orangeville Music Theatre’s Calendar Girls 2017 calendar, in support of Dufferin Oaks’ Music & Memory SM program, will be launched September 15th with a cocktail party. Our beautiful models will be there along with sponsors and music and theatre enthusiasts to give the calendar a grand “kick off” that will include a presentation about Music & Memory SM and entertainment by the Orangeville Chorus Sweet Adelines International. The launch will take place at 7 pm in the courtyard on the main floor of Dufferin Oaks, located at 151 Centre St., Shelburne. Calendar Girls the play, written by Tim Firth, will be performed at the Orangeville Opera House on January 13 th , 14 th , 15 th , 20 th , 21 st , 22 nd , 2017. The play is almost always performed in conjunction with the production of a calendar in support of a local cause. Orangeville MusicTheatre, being a music theatre, could not have chosen a better charity than Music & Memory to partner with for this event. the elderly or infirm through digital music technology, vastly improving quality of life. Dufferin Oaks is a Music & Memory℠ certified home with a committee of staff developing personalized music play lists on iPods for their residents. The music helps with responsive behaviours, sleep and rest and to provide moments of joy and comfort. Gail Campbell, Orangeville Town Councillor; Kay MacGregor, founder of Orangeville Music Theatre; 15 members of Sweet Adelines International; Lynda Clare, artist and Betty McCabe, retired teacher and Community Support Day Program Volunteer. The calendar will sell for $20.00 each with profits going to MUSIC & MEMORY℠. To own one of these beautiful calendars please visit Enchanting Esthetics, Shelburne;Royal LePage, Shelburne; Scented Drawer, Orangeville; The Chocolate Shop, Orangeville;Broadway Farm’s Market, Caledon; or The Bartlett Gallery in the Alton Mill Arts Centre, Alton. See People You Know At The Shelburne Royal Canadian Legion Weekly Wing Night Events. 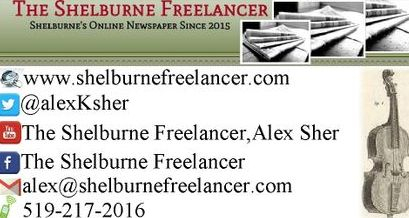 Click image (L) to visit the Shelburne Legion Photo Gallery. During Shelburne Home Hardware Building Centre's May 24th BBQ held over the long weekend, $1000 was raised in support of Special Olympics Dufferin County. Geoff Dunlop, local advocate and volunteer accepted the cheque Friday, September 9, 2016. (L to R) Carole Gillam, Bill Gillam, Staff Members Vickie Stevens, Danny Duarte, Geoff Dunlop, and staff members Lynn Downing and Sandi Cechet. Shelburne Home Hardware Building Centre's Owner, Bill Gillam. "From the tent to the yard gates, it was a sunny 3 days and everything's gone! Thank you to all our amazing customers for supporting the sale and taking advantage of all the blowouts deals! The weekend was a huge success! A special thank you to courageous people, Teresa & Duncan Paterson for cooking all weekend in support of their daughter and the Natasha Paterson Memorial Fund! It was truly inspiring to her. The positive feedback from my staff and customers who supported the BBQ and helped raise $1200 for the memorial fund in her name which will be donated to local charities! A huge thank you to all my wonderful staff who were instrument in preparation, setup, selling and teardown. It's a huge commitment by all our team to do this for the past 14 years for both May 24th and September Labour Day weekends, but they did, so a huge thank you! Hope everyone that attended enjoyed the Hot Dogs,drinks and popcorn. I look forward to seeing all the ladies at ladies night! The date will be announced soon." (LtoR) Duncan Paterson, Bill Gillam, Teresa Paterson, and Lynn Downing. Shelbure Home Hardware Building Centre. 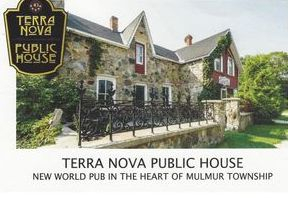 Terra Nova Public House offers the perfect combination of rustic charm, wonderful food, ambiance, in a completely relaxing setting. Treat yourself today! Click on images below and visit their website. What do Octopus, Goats, Toads and Sheep Have In Common? The Market Taking Turkey Orders Now! Stop in, place your order for Thanksgiving, and visit with The Market's Baby Goat!